Bitcoin's price action this year may be dismal, but it might not be without precedent. Having hit a record high near $20,000 in December, the world's largest cryptocurrency began 2018 backed a wave of optimism. Since then, however, it hasn't translated this into gains for investors. 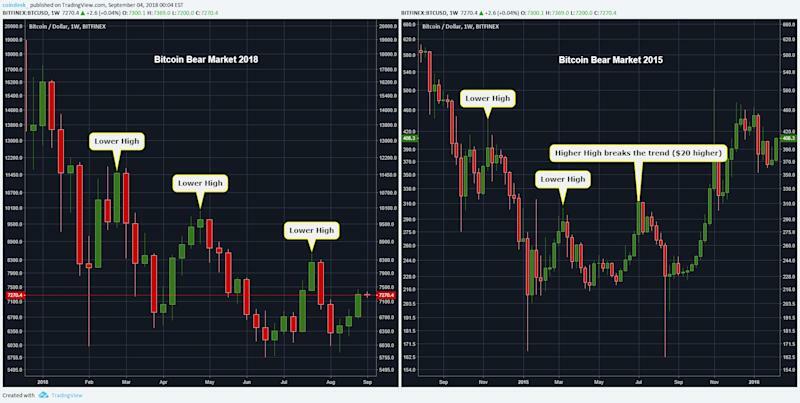 Why is that important for traders now?Â When the bull market ended last time around, we saw a violent drop in price whereby bulls were unable to produce any significant highs over the course of the year. Comparing 2018 to 2015, there are other subtle similaritiesÂ to draw on for analysts. 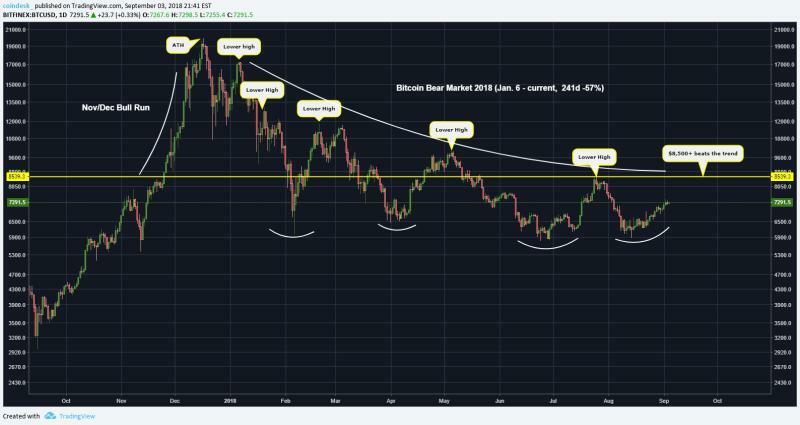 The difference, however, is that while 2015's trend was finally broken by a higher high on July 6, bitcoin's current bearish trend has not been breached in 2018. As such, breaking that trend at $8,500 (the previous significant high) could be key should history repeat. Bears who have been in full control since the start of the year have defied each attempt to move higher, slapping bulls down with added sell pressure.Â However, the subtle differences between each drop have lessened in intensity. More importantly, despite the lower highs, the bears have repeatedly failed to secure a weekly close below the February low of $6,000. Further, BTC's rally from the August low of $5,859 has created a first higher low of the year. The bearish conditions that have gripped the greater markets appear to be weakening with a slow and steady rise in bitcoin's current trend. A convincing close above the previous monthly high at $8,500 would break the bear trend, producing bitcoin's first major bullish move since the year began.